What Kind of Potatoes Are the Healthiest? All potato types are high in carbohydrates and contain a moderate amount of calories as well as healthy amounts of fiber, vitamins and minerals. The kind of potatoes that may be the healthiest are those with darker-colored flesh, such as the Purple Viking, Yukon Gold and Ruby Crescent. The pigments in these potatoes provide flavonoids and carotenoids that promote good health. All potatoes make a healthy addition to your diet. 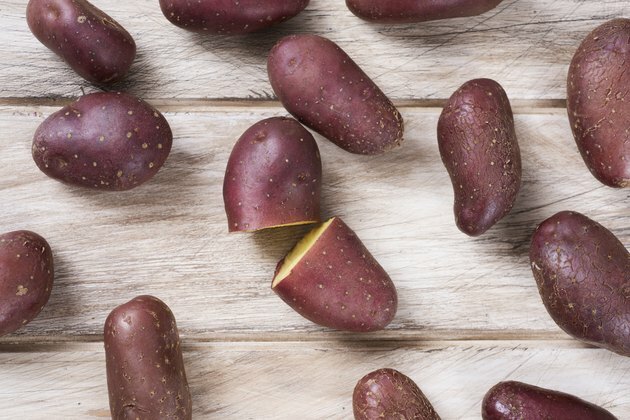 But potatoes with more color, especially red and purple potatoes, offer more nutrition with each bite. Potatoes are low in calories, contain no cholesterol or fat and are high in fiber. Vitamins in potatoes are plentiful and contain significant amounts of vitamin C and potassium, as well as vitamin B-6 and iron. A medium potato will provide about 110 calories in the form of carbohydrates and about 8 percent of your recommended daily allowance (RDA) of fiber. A single spud meets about 45 percent of the RDA for vitamin C and nearly 18 percent for potassium, an essential mineral. The nutrition of potatoes also boasts small amounts of calcium, magnesium, zinc and phosphorus. All potatoes are rich in complex carbohydrates, which contain starches, glycogen and fiber. Carbohydrates are the body's fuel source and are essential for muscle and brain health. While excess carbohydrates, like any other food, can contribute to weight gain, they are vital to your body. Foods rich in carbohydrates and fiber can help reduce your risk of heart disease, protect against diabetes and control your weight when part of a balanced diet. Potato nutrition also provides fiber which can help lower cholesterol and keep your digestive system regular. Potato types come in a wide range of colors including white, yellow, red and blue. They're also classified according to their starch content. Potatoes with high starch content are generally used for french fries, as well as baked potatoes and mashed potatoes. Potatoes with low starch content are also called waxy potatoes, and they usually make good potato salads because they keep their shape and don't fall apart. While all varieties contain roughly the same potato nutrition and amounts of carbohydrates, the more colorful varieties also contain pigments called carotenoids and flavonoids that may protect your cells from oxidative damage. Dark yellow potatoes contain beta-carotene, a nutrient that your body can use to manufacture vitamin A. Sweet potatoes aren't technically potatoes since they come from a different family of plants, but they are related. Potatoes of all colors are from the botanical family Solanaceae, while sweet potatoes are from the Convolvulaceae family. Sweet potatoes are available in orange, white, red and golden potato types. The orange variety is also called a yam. Sweet potatoes contain more manganese than regular potatoes and are high in beta-carotene. Unlike regular potatoes, they don't contain alkaloids that may provoke an allergic response in some people. Although potatoes don't contain fat or cholesterol, their nutritional value can significantly change depending on how they're prepared. Starchy potatoes that are deep-fried, as well as potato chips, can absorb a significant amount of cooking oil and add unwanted calories and fat to your diet. Baked potatoes served with butter, sour cream or other toppings can add in loads of calories, too. Consider eating small organic spuds served with the skin, which contains most of the valuable fiber and vitamins in potatoes. Be sure to watch your serving size and use recipes that combine the potatoes with other healthy fats, such as olive oil. You can bake the potatoes with olive oil, garlic, and herbs to add flavor and fiber to any meal. Remember to choose potato types that add color to get the most nutrition of potatoes with each bite.